At the End of the Rainbow opens August 13, 2015 during Art Design & Dine from 5-8 PM. Artist Chino Zhao, a visiting scholar from China spending the year in Laramie, created these new works in the University of Wyoming print shop. He’s been experimenting with intaglio printmaking techniques and playful political content. “Chino”, Qian Zhao, has used this year in Wyoming on a Chinese Council Fellowship as a time of examination of self, home, and to improve language skills and learn about others. At home, in Guangzhao, China, Chino teaches silkscreen and works primarily with silkscreen and painting. The body of work produced in Wyoming represents an exploration with less familiar intaglio processes. The initial images are developed, drawn, on his computer in a manner not unlike the early stages of how he develops a silkscreen. The digital information is then photographically transferred to a copper plate and he continues to refine the image on the plate. The intaglio printing process requires that ink be pushed into incisions and crevices on the intaglio plate and then forcefully applied to paper as it is run through the press. This is very different from the gentle stenciling process of silkscreen. As Chino’s work with intaglio has continued, he has embraced some of the unique qualities of the intaglio process and has explored not only the editioning of images, but produced unique images through specific ink application, layering of ink, or manipulation of pressure. Creating monoprints is less common in China and more prevalent in western approaches to printmaking. Letting go of media “rules” is breaking cultural expectations and is not simple. Chino’s choice of process directly speaks to the imagery of the bills he references. 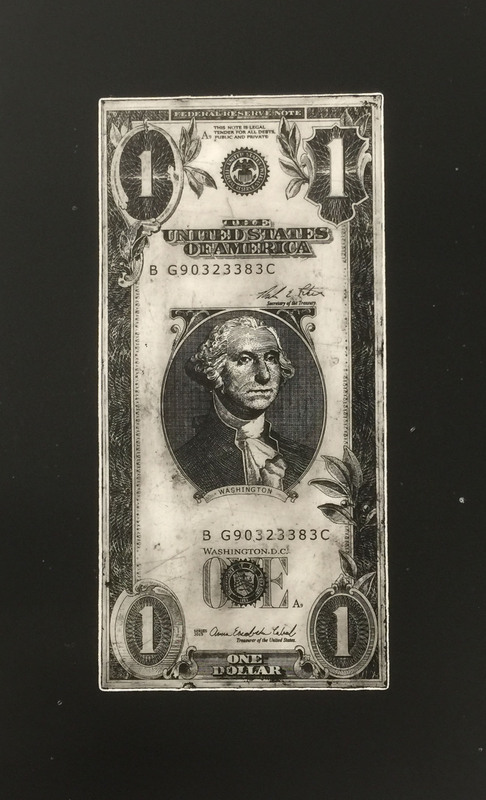 Most world paper currencies are engravings and intaglio printed. Chino’s manipulation of the bills questions how economies are connected and addresses recent and current political interactions of China and the U.S. These are important and difficult questions, but presented playfully and quietly. How this work is understood in the U.S. may be very different from how they are interpreted by a Chinese audience. Perhaps my favorite works are the images that allow the men we associate with familiar national currency to leave their paper frames and interact. Ben Franklin and Mao echo Chino’s own adventures and friendships. Will George and Mao race that big car and the motorcycle? Who will win? Mao’s portrait on George Washington’s mantle are evidence of a friendship – a kindness and respect between two men who live on very different pieces of paper. Providing iconic portraits the means to escape expectations, to travel, can only produce “broad and charitable views of men and things”. Mark Twain would be proud. At the End of the Rainbow will continue through September 2015, and have a second opening on September 10 from 5-8 PM.